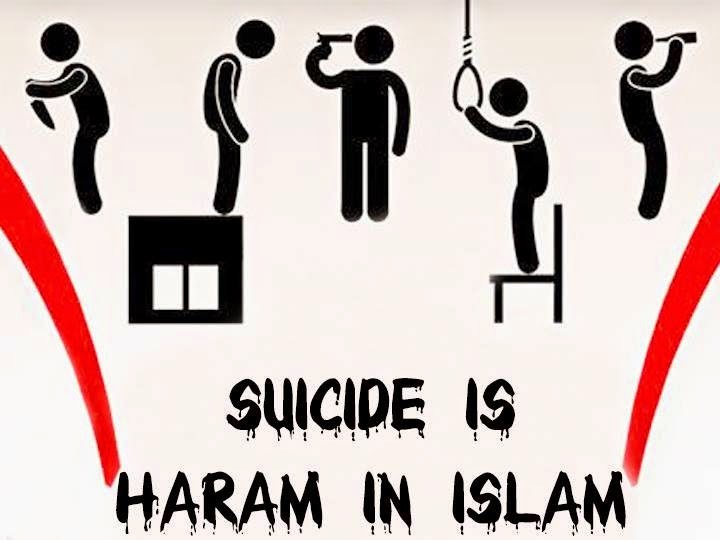 It is Narrated on the authority of Abu Huraira RadiyAllahu Anhu that the Messenger of Allah (Sallallahu Alaihi Wasallam) observed: He who killed himself with steel (weapon) would be the eternal denizen of the Fire of Hell and he would have that weapon in his hand and would be thrusting that in his stomach for ever and ever, he who drank poison and killed himself would sip that in the Fire of Hell where he is doomed for ever and ever; and he who killed himself by falling from (the top of) a mountain would constantly fall in the Fire of Hell and would live there for ever and ever. Urdu Translation: Hazrat Abu Huraira RadiyAllahu Anhu se Riwayat hai ke RasoolAllah Sallallahu Alaihi Wasallam ne Irshad Farmaya: Jis ne lohe ke hathyar se khud kushi ki to Jahannam ki Aag mein wo hathyar us ke hath mein hoga aur wo us se apne Pait ko hamesha zakhmi karta rahega, aur Jis ne zaher pi kar khud kushi ki to wo bhi Jahannam ki Aag mein hamesha hamesha us zaher ko ghoont ghoont kar pita rahega aur Jis ne pahad (ya kisi unchi jaga) se gir kar Khud kushi ki to wo bhi Jahannam ki Aag mein hamesha hamesha pahad se yunhi girta rahega. Narrated Jundub RadiyAllahu Anhu: Allah's Messenger (Sallallahu Alaihi Wasallam) said, "Amongst the nations before you there was a man who got a wound, and growing impatient (with its pain), he took a knife and cut his hand with it and the blood did not stop till he died. Allah said, 'My Slave hurried to bring death upon himself so I have forbidden him (to enter) Paradise.' "
Urdu Translation: Hazrat Jundub Radi Allahu Anhu se rivayat hai ki Rasoollallah Sallallahu Alaihi Wasallam ne farmaya pichle zamane mein aik shaksh (ke hath mein) zakhm ho gaya tha aur us se use badi takleef thi Aakhir usney churi (knife) se apna haat kaat liya us ka Natija ye hua ke khoon bahne laga aur usi se wo mar gaya phir Allah Tala ne farmaya ke mere bande ne khud mere paas Aane mein Jaldi ki isliye maine bhi jannat ko is par haram kar diya.